Mechanical keyboards have a distinct feel. They have great tactile feedback on every stroke. This feature makes them popular for gaming and typing. But they don’t always come cheap. Finding the Best Mechanical Keyboard on a budget is a process of comparing numerous features which can be frustrating. If you are not patient enough, you may end up with a cheaply constructed keyboard that does not come close to fulfilling your gaming and typing needs. We’ve compiled the Best Cheap Mechanical Keyboards under $50 and $100. We hope it will be worthwhile as you make your choice. The form factor of your keyboard is a significant consideration. Full-size keyboards are either ANSI 104 or ISO 105 keyboards. They have all the keys including the number pad. The tenkeyless keyboard does not have the number pad but includes all other keys including the function keys. There are also 60% mechanical keyboards. They do not have the function row, number pad, and arrow keys, they are the most compact models that remain functional. The keys have a prominent bump when the key is pressed down followed by a click sound. The keys also have a bump midway through pressing, but a click sound does not follow it. These are simple to operate switches. They move up and down without any bump or click sound. There are many different types of switches to expect with a mechanical keyboard. Here we are talking about Cherry MX switches, Kailh, Steel Series, Romer-G, etc. Cherry MX is the most famous switch brand which has patented their MX Black, MX Blue, MX Brown, and MX Red. These switches have a distinct click and tactile feedback. Writers and professional typists prefer them because they allow you to feel the keypress as soon as it is registered. It will enable you to type fast because of the small actuation distance. These switches are linear. They require clicking until they bottom out because of lack of tactile feedback. They have a high actuation force which is not ideal for typists. If you are a fan of first-person shooter games, you will probably prefer this type of switch. These switches have a good balance of actuation force, distance, and tactile feedback. They are preferred for most games since you can feel when you make a keypress. They allow you to press multiple keys with fewer mistakes. Typists will also favor these switches because they are not loud like Blue switches. These switches have the least actuation force in the Cherry MX line. They don’t have that much tactile feedback because the key is linear. It goes straight up and down. Because of the less actuation force and small actuation distance you will not feel tired after long hours of gaming. This company has branded their switches as orange, green, and yellow switches. Razer Orange Switch is much like the Cherry MX Red switch. It has 45cN actuation force with tactile feedback and no click sound. Razor Green Switch is tactile and clicky. It offers a long actuation distance and an average actuation force of 50cN. They are used in many gaming keyboards. The Razor yellow switch has the shortest actuation point at only 1.2mm. It is linear in that it does not have tactile feedback and it is silent. These switches are normally used in fast-paced gaming. Kailh has similar switches to Cherry MX switches. Their red is a linear switch, and the brown is a tactile switch while the blue is a tactile, clicky switch. Romer-G is a tactile switch seen in some Logitech mechanical keyboards. It is weighted like the Cherry MX Red at 45cN. This feature is important more so for gamers. You can go with a keyboard that offers single color backlighting or RGB lighting where you can allocate a color to every key for faster mastery. Backlighting also comes in handy to provide illumination when using your keyboard in low-lit environments. With cheap keyboards, you will rarely have more than one color backlighting. Why we like it: Built in a compact design, this model is designed to fulfill the desires of a small keyboard while retaining full usefulness. 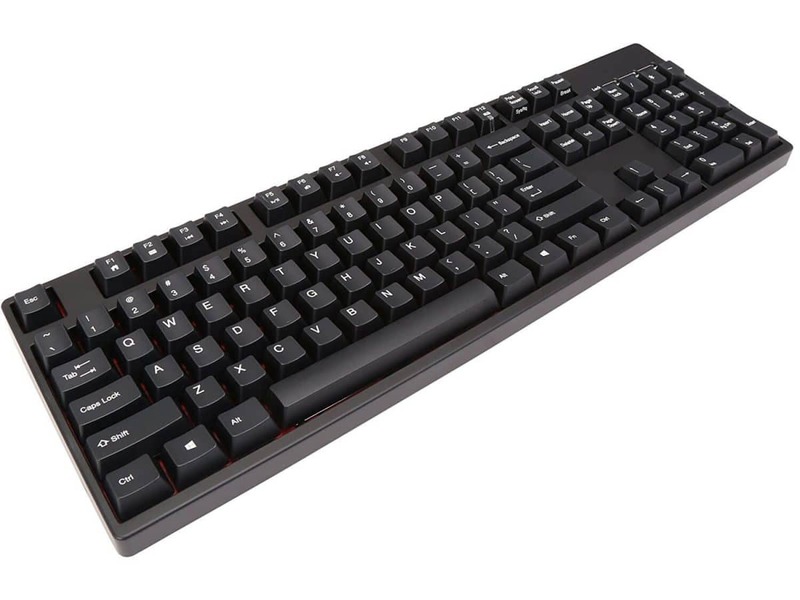 Although small, Redragon K552 KUMARA is a great option for both gaming and typing. Its custom switches are Cherry Blue equivalent, to give tactile feedback and maximum durability. You will be using this keyboard for a long time thanks to the high-quality switches. The double-shot injection molded keycaps are designed to allow proper red backlighting so that you will never miss a key press. It has red backlighting which is a nice addition seeing that you will be paying very little to acquire this model. You can adjust the brightness setting to suit your exact illumination. It incorporates a metallic plate for the foundation of the keys. 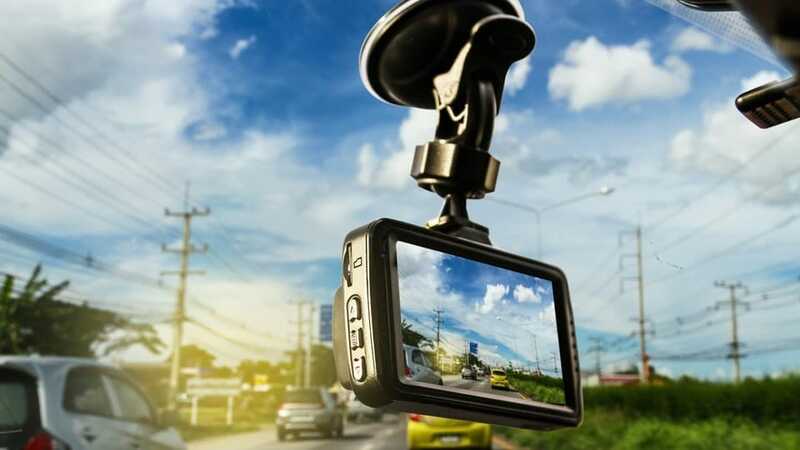 This lines it up with durable performance alongside the aircraft-grade aluminum base. All the keys are anti-ghosting, and it includes ten multimedia keys. Redragon K552 KUMARA is compact. It includes only 87 keys meaning you get to keep the mouse close by for both gaming and typing purposes. Even though the USB is not detachable, you can pack it without risk of damage. It is a bit heavier than tenkeyless designs, so we don’t foresee you carrying it over long distances. You have a reliable keyboard from a favorite brand. It is comfortable to type and game on a space-saving model that does not sacrifice any performance features. The red backlighting is an incredible feature on a cheap mechanical keyboard. Why we like it: This keyboard is carefully constructed with robust components to improve its longevity. It is worth every dollar and so much more. Featuring an aircraft-grade aluminum body and a sturdy ABS base plate, EagleTec KG011 is not taking any chances when it comes to longevity. They keycaps of this model have double-shot injection molding which displays the backlight uniformly while preventing fading of the letters. With custom built blue switches, this keyboard will give you comfortable typing. It has commendable tactile feedback and an audible click when the key actuates. It will save you typing time and also help you type more correctly without constant confirming after you press a key. This is not one of the keyboards that will have its keys stick a year barely after you buy it. The mechanical switches are built to withstand punching and heavy use in offices. All the 104 keys are fully anti-ghosting. They also support n-key rollover that is applicable in gaming. It can withstand common liquid spills that will need wiping, and you can continue to enjoy using it in crowded offices where spill accidents can happen at any time. The WASD and arrow keys are interchangeable while the WIN key can be disabled during gaming. These features allow it to function well if you use it for games. The EagleTec KG011 is not dedicated to gaming, but it performs with excellence for typing and office work. It expresses lots of durability features from the body to the base plate and the anti-spill protection. Why we like it: High typing accuracy with remarkable tactile feedback. This keyboard is an excellent choice for typing and programming. The TOMOKO mechanical keyboard is a water-resistant design that comes with drain holes. It ensures your keyboard will remain functional and not water-logged when you spill liquids on it. It even includes a keycap puller to use when cleaning it. OMOKO uses blue switches that come with an audible click and crisp tactile feedback. It provides high accuracy that eliminates typos and errors in typing. You can count on this keyboard for coding purposes and entry of data thanks to the tactile feedback. All the 87 keys are anti-ghosting to allow seamless key presses. You can press on several keys at once so that you can input multiple combinations without conflicting inputs. This keyboard has a top-quality construction from ABS that is complemented by a metal base. The keys are laser printed, and they take a cascading form. This is to keep your hand at a comfortable angle to prevent hand fatigue with hours of typing. It is without a doubt that the TOMOKO model is built for multiple purposes. It is ergonomic to offer maximum comfort and minimize hand fatigue. It is a utilitarian keyboard that you will love to use either in the office or a spare keyboard at home. Why we like it: It has a unique crack surface that is an attractive choice for gamers. The ABS materials are all top-quality too. When you think of a cheap gaming keyboard, it may lack lots of incredible features, but Bluefinger makes sure to include the ones that count. First, this keyboard is backlit where it offers three different colors including purple, blue, and red LED. You can change these colors using the function keys and also effect one of the three breathing modes. With an ABS construction, this model is going to last in good condition since it exhibits good quality. 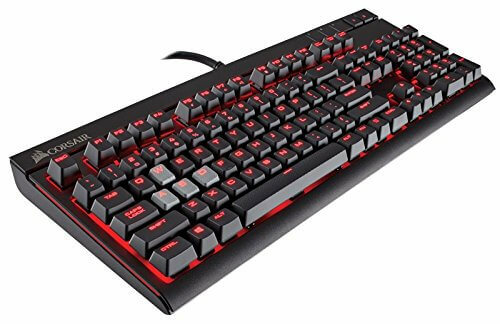 Its keys have great tactile feedback that accounts for the quick and accurate responses needed in typing and more so gaming. All the keys are fully anti-ghosting. It offers up to 19 keys rollover to provide for multiple keying. The 10 media hot keys come in handy to allow quick control of your music such as skipping a song or increasing the volume. This keyboard is replete with incredible features including double-shot injection molding to the keycaps. It ensures the lighting is uniform and that the keycaps will last in top notch condition. It allows you to customize the colors using the function keys. This way, a single color switch, and three colors can alternate for a truly personalized setting. The Bluefinger mechanical keyboard is comfortable for effortless use. It gives you a cracked surface that is at par with gaming specs. This model is an entry-level model that will provide you with basic gaming performance because of the few gaming customization options. Why we like it: This keyboard uses high-speed mechanical keys that have high tactile feedback but very quiet. It is great as gaming and a typing keyboard for a very generous price. Logitech is best known for their innovative products that favor specific users. This mechanical keyboard is both functional and highly capable of meeting your needs in gaming and typing. With tactile keys, you can feel every keystroke since it has a bump when the key actuates. It saves you from waiting for the key to bottom out before the key is registered. 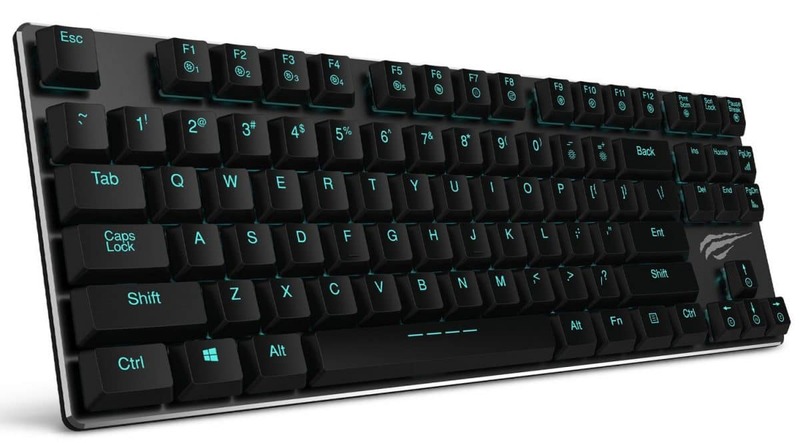 It is more of gaming-oriented seeing that it has six programmable G-keys that give you access to 18 functions for modifying and personalizing your game. Every G-key has three macros. Not to mention, it has 110 anti-ghosting keys and 26-key rollover. It is a sure way to make numerous combinations with different keys when gaming. We like that the keys are not clicky so you won’t be dealing with any noise that can be very distracting at times. Each keycap has a dampening ring that keeps out the sound while the keys maintain their high responsiveness. With the adjustable dual-zone backlighting, you will be able to adjust the lighting of this keyboard more so on the WASD keys such that they will remain visible even in low-lit environments. You also get USB 2.0 pass through where you can connect the mouse or headset. 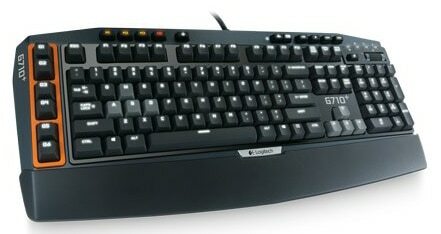 Logitech G710+ is an excellent product looking at the responsiveness and the quiet input of the keys. 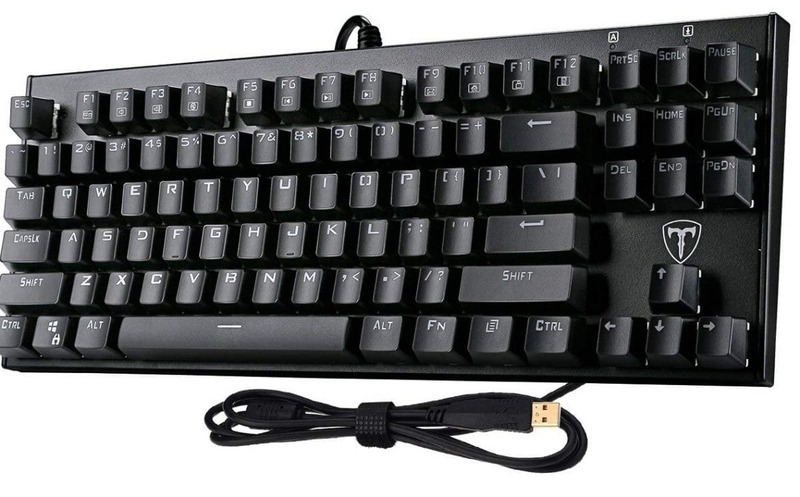 It uses Cherry MX Brown switches that offer both gaming and typing functionality. It is an affordable model that will come close to the performance of other expensive options. Why we like it: Outstanding in-game performance with full-key programming and creating of macros. 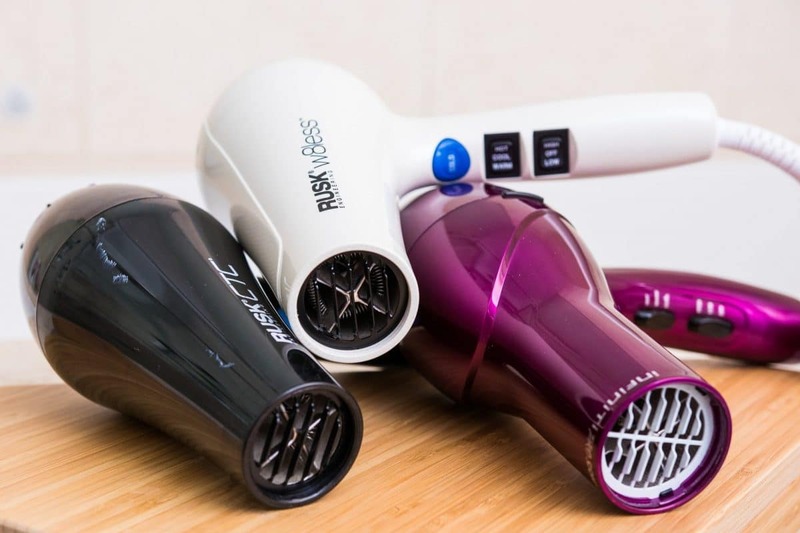 It offers comfortable handling and exceptional control. With Corsair, it is apparent that you get more value for your money than with any other gaming keyboard at this price range. Corsair Strafe is a hub of customization since every key is programmable. You can reassign different functions to all the keys and even create macros that will give you an advantage over opponents. Looking at the switches, this model uses Cherry MX Red switches. These are linear switches that require very little actuation force. They allow you to press fast and comfortably so that you won’t be wasting time going over a command. You have all 104-key rollover and are 100% anti-ghosting no matter how many keys you press. Every key will register quickly, thus setting you for wins as you can play faster and more accurately. This keyboard comes with textured keycaps. They provide simple keying as you can feel each key. It also has red backlighting that is a soft red under each key. You can personalize it using six default presets. It allows you to create a lighting pattern with the help of Corsair Utility Engine (CUE) software. The CUE software is a thoughtful support system since you will be able to create macros and save the button sequences that you record. If you want a keyboard that is more gaming-oriented, the Corsair Strafe is an excellent pick. It is fully customizable, backlit, and it has dedicated macro keys and gaming mode key. It is also well made with a high-quality plastic exterior that promises decent service. Why we like it: Solid typing and gaming performance. It is a well-constructed keyboard with few bells and whistles while maintaining impeccable functionality. 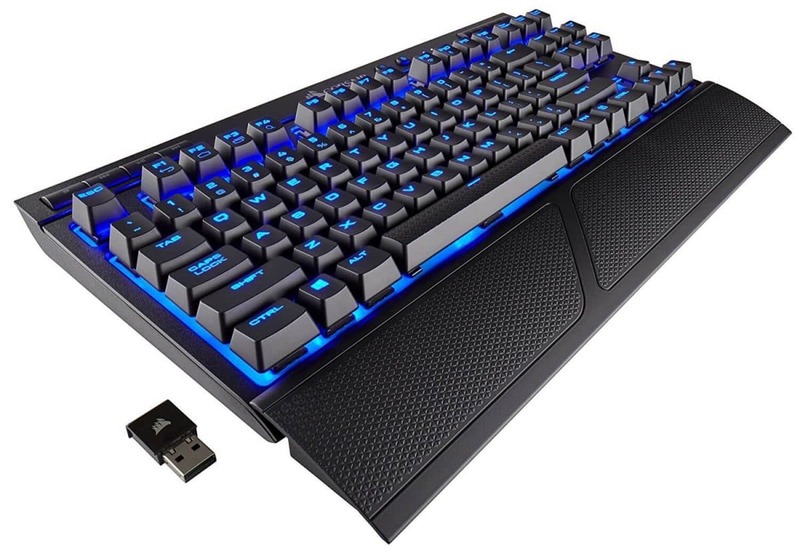 Even though Rosewill has not included any backlighting, this keyboard is a good option for everyday gaming. You have a keyboard that uses Cherry MX Brown switches. They give high responsiveness to get you punching keys with speed so that you are not left behind in intensive games. It has an N-key rollover function that comes in handy to allow you to make numerous key combinations. It is an essential aspect of gaming since you can flash out enemies using simultaneous key presses. Better still, it has shortcut keys that help you control your audio setup without leaving the keyboard. With 50-million keystrokes lifespan, it is without a doubt that Rosewill is built to last. An essential feature of this model is the metal base plate. Although the body is of matte plastic, the base plate lets you know it is solid and that the keys are planted on a solid foundation. This keyboard is wired, so it comes with the USB cable. There are complaints about the cable connector as it does not have any support for the cable. Even with its little flaws, Rosewill RK-9000V2 BR remains a favorite among casual gamers and typists. It is stable on the desktop thanks to the wide rubber feet, and it has a robust built that includes a metal base plate. 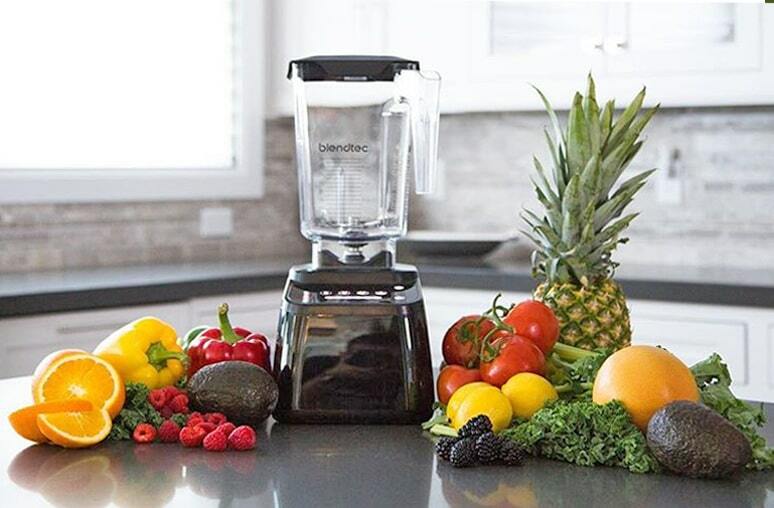 We believe it is a good pick in terms of durability and physical performance. Why we like it: It is a tenkeyless keyboard with a detachable USB cable. It is portable and lightweight to give you the functions of a mechanical keyboard on the go. If you are looking to own a cheap and portable mechanical keyboard, then you will love the Havit HV-KB390L. It functions adequately as a mechanical keyboard since it uses Kailh Blue switches. These are tactile and clicky switches that are great in the hands of professional typists and clerks. You will find that there is a click after every key press. It lets you know when the key actuates so that you can proceed with typing without repetitions. It minimizes errors so that you can cover more work and meet deadlines with the help of this keyboard. Without the number pad and weighing only 1.15 pounds, you can pack this keyboard and take it to meetings. It is just 7mm thick to give it a low profile that will sit nicely in a bag and desktop. 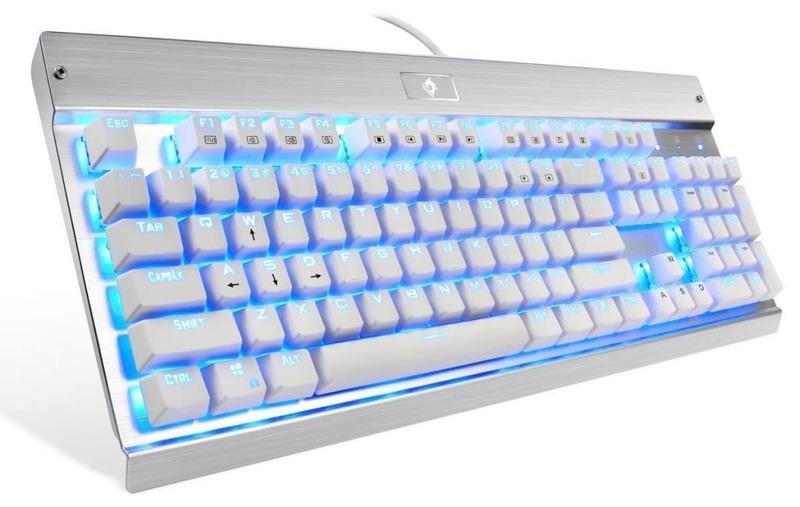 This keyboard is backlit in one color that Havit calls ice-blue. It is a cool color since it is catchy but not distracting in the office. The only thing you will be hearing is the sound of the clicks. But you can customize the lighting. There are five custom modes, and thirteen presets alongside different sub-effects. It allows you to set and save different light settings so that you can access them at any time using the shortcut keys. The Havit HV-KB390L is an easy pick for a cheap compact mechanical keyboard. The keys have tactile feedback to eliminate hassles during keying which gives you satisfactory clicking in the process. It is an entry-level mechanical keyboard that typists will love. Why we like it: This keyboard has a sturdy build to support its gaming capabilities. Its many customization features favor MOBA and FPS games. 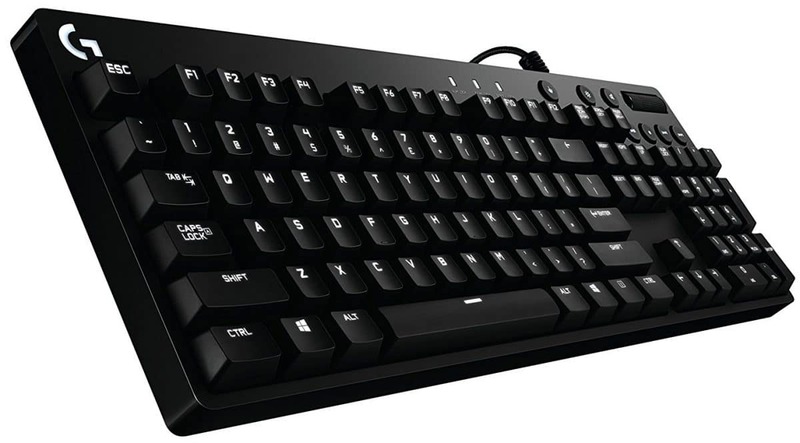 Logitech G610 Orion is a full-size keyboard that is oriented towards gaming. Many people agree that it is smooth and comfortable to use because it uses Cherry MX Red switches that are effortless to press. It will be fast to key in commands and get your games in action without distraction from click noises. For gaming purposes, this keyboard allows you to create macros using the function keys. It also has media keys and a gaming mode key that disables the Windows key. Volume adjustment is by a large volume wheel next to the playback controls. The white LED backlighting is also very intuitive. You can change the color effects and the brightness of every key. This way, you will keep up with the different spells and profiles that you create. What’s more, all the lighting customization effects can be saved and synced with all Logitech devices. Using the Logitech G software, it is super easy to control your profiles after you create them. This is by setting a specific profile for a particular game so that you don’t have to create the profile every time you are playing that game. Logitech G610 Orion is not an average pick in mechanical keyboards. It has intuitive personalization and gaming features. From the capacity to create macros to customization of the lighting effects, it is a good companion for gaming. Why we like it: It is under $100 offering wireless capabilities without lag. It is perfect if you switch positions a lot when gaming. Corsair K63 is a tenkeyless model with wireless functionality. Yes, you get to have all the freedom you need when it comes to moving from one desk to another or gaming from the comfort of your couch. It does not suffer input delays and dropouts even at the low price. It connects wirelessly via 2.4GHz band at 1ms response time. You will never remember it is a wireless keyboard because of the flawless operation and connection. The Cherry MX Red switches give you precise performance because of their superfast actuation force. All the 87 keys have key rollover and are full anti-ghosting. You get additional media keys on the top side of the keyboard. These keys are vital since you will be controlling your music from the couch and won’t be needing to go back to your computer to adjust the volume. This keyboard has blue backlighting. It has options for changing the brightness from dim to bright according to your liking. It also has a key to lock down Windows so that you don’t keep toggling between the two when gaming. This keyboard offers 15 hours of battery life. Without the wrist rest, it will be easy to pack and use on the go knowing you can depend on it for hours of gaming. With the 128-bit AES Encryption, your data is protected from privacy intrusions. Now you can ditch the wire and game from your favorite position. Corsair K63 brings you freedom, convenience, and a practical solution. You get to enjoy long hours of gaming with superior connectivity. And, it has good range your computer does not need to be close to you for seamless gaming when using the Bluetooth 4.2 adapter. Computer enthusiasts and gamers all rave about mechanical keyboards. And when you want one on the cheap, it is not an easy process. Every manufacturer is looking to include as many features as they can, to account for their exaggerated prices. When searching for an affordable mechanical keyboard all you have to do is look for the features that actually matter or do customization. Mechanical keyboards have the classic feel where you can hear the click in every stroke. They have mechanical switches which result in high accuracy, responsiveness. Unlike membrane keys, you will know when you make an entry or not. Mechanical switches have the longest lifespan. Some have over 50-70 million keystrokes which are not comparable to keyboards that have rubber domes. This feature gives you great value for money because it is not liable to break for a very long time. Not to mention, they do not lose their feel even after a couple of years. You will rarely experience stuck or cluttering keys. When you press any key on a mechanical keyboard, it is hard to miss the click that follows. This is why they are usually referred to as noisy. But this comes with the advantage that you will press the key halfway through so you can type faster because you can proceed to the next letter as soon as you press the key. When you are sure you typed in a letter, it minimizes errors and typos especially if you are a professional typist who has to type thousands of words every day. With a mechanical keyboard, you have a variety of switches to choose from. There are red, brown, blue, black, green, and many others from different brands. These switches have distinct roles where red and brown MX switches are used by gamers, while typists use blue MX switches. It is only fair that we discuss the cons of a mechanical keyboard. These keyboards come with a little extra weight while others have more keys when designed for gaming. As such, you may not be able to carry them in your bag because they look and feel bulky. As we said, some of these keyboards have a click sound. Sometimes, they can be too loud that may not be an ideal choice if you work in a quiet office. Your keyboard is something you plan to use every single day. The last thing you want is fatigued hands before you have finished typing your first article of the day. That is why you will need to consider a keyboard with the right key height and ergonomics. Also, keyboards that have a wrist rest are more comfortable. You should consider buying a separate wrist rest since most mechanical keyboards are not supplied with one. After knowing about the form factor and the switches you will want to look at the quality of the keycaps. Some keyboards will have printed letters while others are lasered. This is mostly with cheap keyboards. They will last for a decent time, but they are prone to getting shiny and wearing off. If you can get your hands on a double-shot molded keycap model; you will have better chances at improved durability. If you are looking to get a cheap mechanical gaming keyboard, you will need to consider if it comes with any customization features. These include creating macros and programmable keys. They allow you to compete at par with gamers who are using an expensive keyboard. As such, you should not go below $50 for a gaming keyboard on a budget. When you press multiple keys at once, some of them, may not be registered which causes ghosting. Every mechanical keyboard will need to have anti-ghosting keys to allow simultaneous key presses. When looking for affordability, you will want to consider keyboards from renowned brands. These are brands that have a line of high-quality keyboards such that they only exclude fancy specs while maintaining a high-quality build in a cheap model. You don’t have to save hundreds of dollars to own a mechanical keyboard. We have scoured the market and the internet to give you only the most functional and practical Cheap Mechanical Keyboards. You can be sure to rely on these keyboards for typing and gaming. These keyboards are ergonomic upgrades with mechanical switches for satisfying clicks that will earn comfortable key presses. 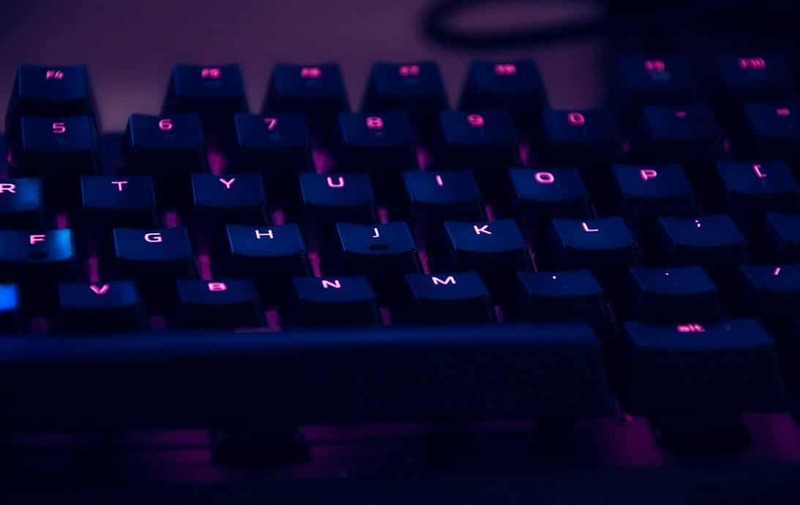 Whether you want a wireless, compact, or tenkeyless model, you can improve your speeds and gaming performance with one of these Best Cheap Mechanical Keyboard.